Use the form below to inquire about Heritage Haveli At Sirsi Village . Use the form below to reserve for Heritage Haveli At Sirsi Village . 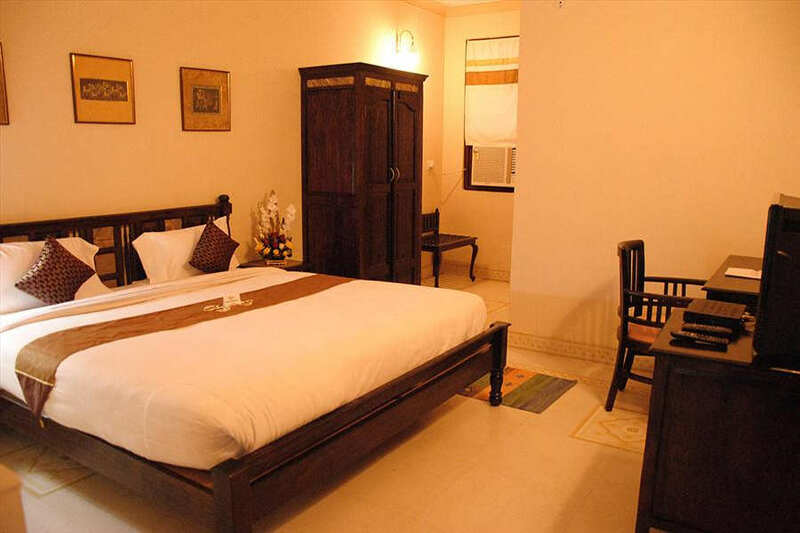 These are spacious room and feature elegant wood furniture complemented by plush furnishings and bed linen. Chill at this Heritage Haveli At Sirsi Village in peaceful surroundings as you enjoy royal luxuries and modern amenities. 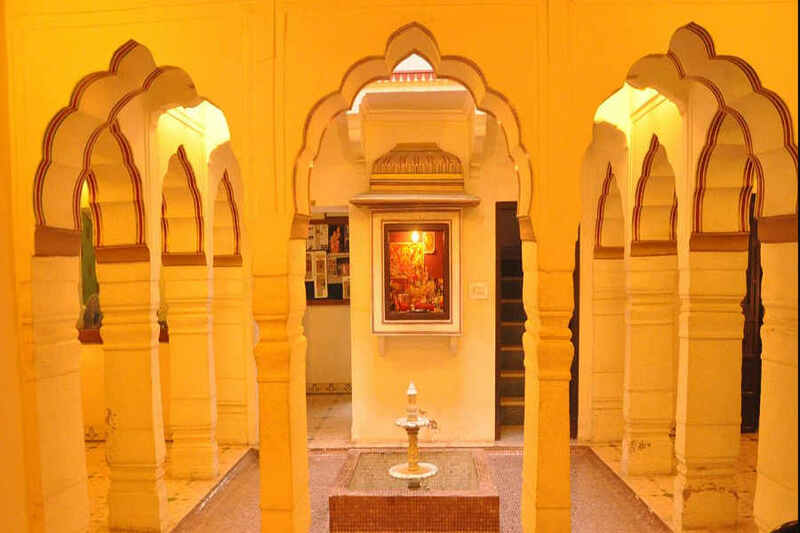 This Heritage Haveli At Sirsi Village, tucked away in the beautiful countryside on the outskirts of Jaipur, is a peaceful haven as you experience Rajasthan. Jaipur city, which is an international tourist destination, with its magnificent palaces, desert , pearls, gems, and vibrant fabrics, is just a short distance from this charming village. Sirsi is a hamlet which was frequented by the Maharaja of Jaipur who was taken by its serene atmosphere and to worship at its ancient temples. More than a century old, this Haveli towers high over the tranquil and laid back village. The design of this Heritage Haveli At Sirsi Village resembles that of a palace. The magnificent exterior arches create a majestic impression. Though the Haveli was renovated to incorporated modern conveniences and luxuries, great care was taken to ensure it retained its rustic heritage and raw charm. The craftsmanship of the past century is still maintained intact. 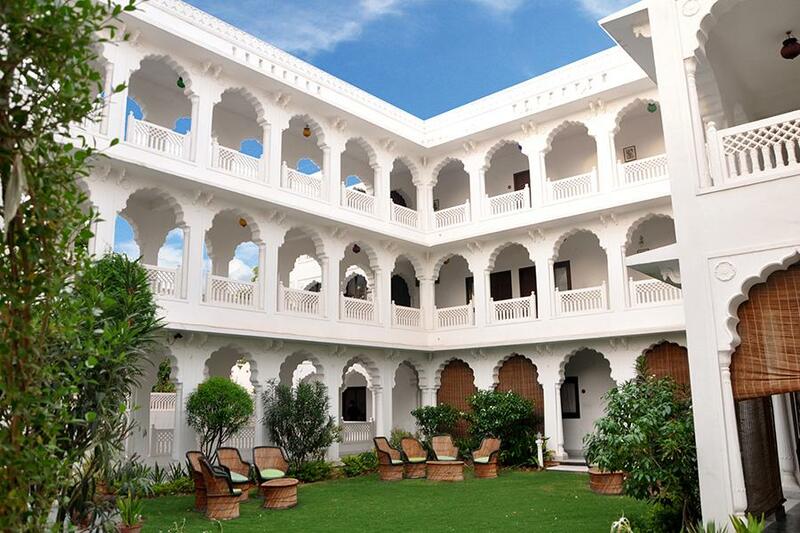 The cool tones on the walls and the grand furnishings create a classic royal aura around the Haveli. The sprawling lawn here makes for a romantic location for outdoor marriages and intimate parties. 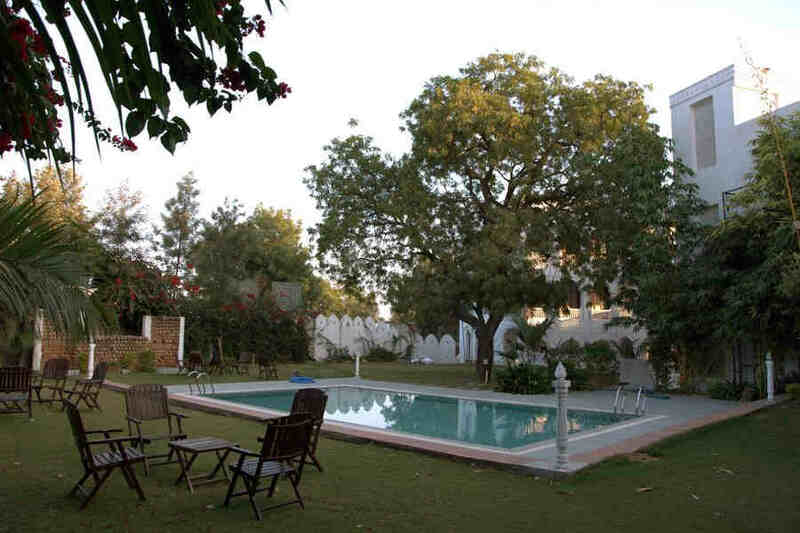 The swimming pool is nestled in the shade of the trees and you can relax in this cosy nook for hours on end. You can recharge and rejuvenate your mind and body with special Ayurvedic massage treatments that can be arranged on request. The air-conditioned restaurant with bar continues the regal theme and serves up lip smacking local delicacies and international flavours. 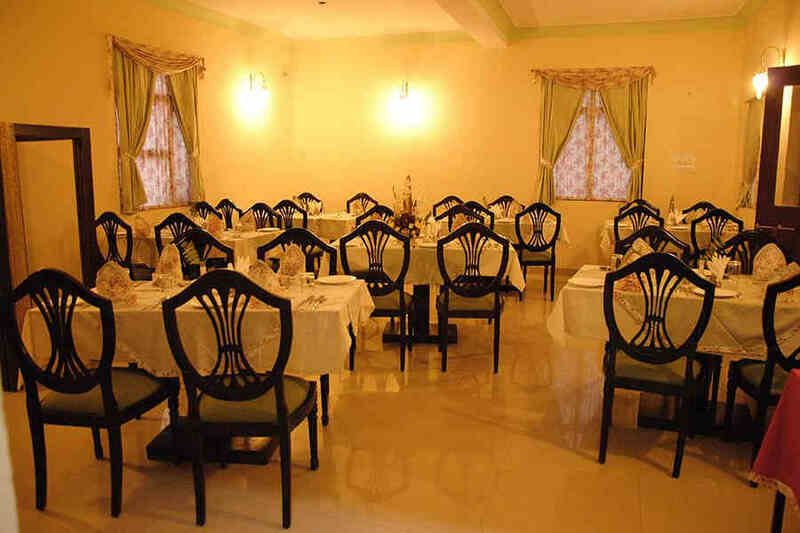 This Heritage Haveli At Sirsi Village offers 15 luxurious rooms with opulent bathrooms. The interiors feature elegant wood furniture complemented by plush furnishings and bed linen. This Haveli makes for an extravagant yet laid back abode in the lap of a rustic Rajasthani village, leaving you pampered and well-rested. Lunch and dinner will be charged at INR 550 INR 650 respectively. You can go for a languid swim in the clear swimming pool on the property or curl up in the shady, poolside seating areas with a book or some music. You can also book Ayurvedic treatments for some rejuvenation and relaxation. Besides this, Jaipur is a hotspot of tourism and has plenty of attractions for you to choose from. The ancient temples of Lord Lakshmi Narayana and Lord Raghunath are synonymous with Sirsi. The Jantar Mantar Observatory, which is a UNESCO World Heritage site, houses 19 architectural astronomical instruments and is close to the hotel. Jaipur Zoo, which opened in 1877, is one of the best in the country and houses a crocodile breeding farm. City Palace Jaipur, which is a blend of traditional Rajput and Mughal architecture, is also close to the hotel. Hawa Mahal is perhaps the most famous landmark of Jaipur. It is a high screen wall with 953 windows, made of pink and red sandstone that allowed royal women to get a close glimpse of the street festivals and busy city life while staying away from public view and is designed like one of Lord Krishna’s crowns. Jaipur is 12 km away along Khatipura Road while Ajmer town is 131 km along NH48. New Delhi is accessible via NH48 at a distance of 270 km.